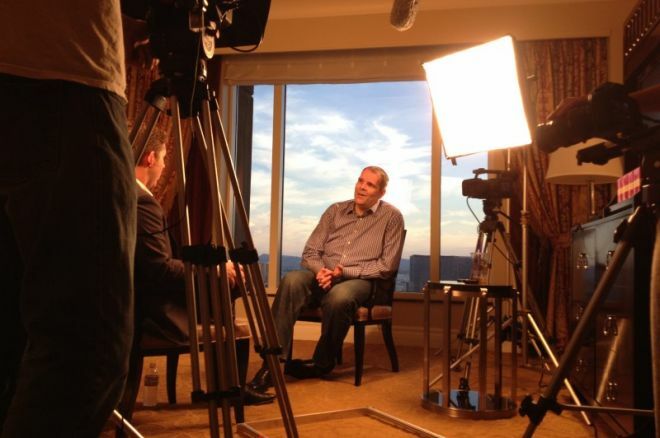 PokerNews is pleased to confirm the upcoming release of "The Lederer Files," a series of videos compiled from an exclusive, seven-hour interview with Howard Lederer on Saturday, Sept. 8, 2012. In the interview, Lederer breaks his silence on the events leading up to and surrounding Full Tilt Poker and Black Friday. On Thursday, Aug. 30, I received a phone call from someone letting me know that Lederer was interested in breaking his nearly two-year silence by sitting down for an interview with PokerNews. Although at that point the process was not clear, I jumped at the opportunity and we began making arrangements with Lederer to finally get answers that the poker community has been waiting for. The prospect of such a monumental interview was exciting, but the burden of representing the very community all of us at PokerNews work so hard to serve was not something to be overlooked. During my initial conversation with Lederer, I made it clear that if he was looking for an outlet to make this easy on him in return for the opportunity to run a story, then we were not interested. This was a non-issue, as Lederer mentioned he was willing to sit down at length, and answer all questions I had as candidly as he could. I also made it clear that my team and I would need adequate time to prepare in full, and that he would need to prepare for quite a long sit-down to cover everything we were hoping to cover. Lederer agreed, and ultimately we decided on a video interview so there would be nothing lost in translation. The poker community deserved not only to read what Lederer had to say, but they deserved to see and hear the answers directly. Over the course of the next week, I went through as much information as I could in relation to Full Tilt Poker's rise and fall, Lederer's relationship with the company, and the indictments and complaints from the Department of Justice. I scoured online poker forums to learn what was most important to the community, in addition to trying to speak to people relevant to the story, most of whom declined to speak or comment. I also spent some time with Lederer to get a better feel for the story itself, and the man with whom I would be sitting face to face with in an attempt to find the truth about the failure of Full Tilt Poker. The interview took place on the 46th floor of The Palazzo in Las Vegas on Saturday, Sept. 8 at 5 p.m., and over the course of the next eight hours, we shot just under seven hours of footage. We initially planned to release the interview a few days later, but it became evident that with such a large amount of footage, there was a lot of hard work left to do to serve the public and the poker community in a way that both accurately depicted what had transpired, but also what was easy to digest and understand. The PokerNews team and I reviewed the footage, and spent the past week editing and preparing for the release of what will ultimately be known as "The Lederer Files." The video will be released in six or possibly even seven 30-minute video segments. It will all begin with part one and part two on Tuesday, Sept. 18, and the remainder of the segments will be released throughout this week. It should be noted that the interview took place before the most recent amended complaint was filed by the Department of Justice on Monday, Sept. 10. The entire team and I and worked as hard as we could to get answers to the questions we knew the poker community would ultimately be most interested in having asked, including topics such as payment processing, segregation of player and operating accounts, Ray Bitar, Phil Ivey, player loans, Black Friday, and the eventual forfeiture of Full Tilt Poker assets to PokerStars. We look forward to sharing this story with you and hearing your feedback and insight. Be sure to keep your browsers locked to PokerNews tomorrow for parts one and two.